For other uses, see Watership Down (disambiguation). Watership Down was Richard Adams' first novel. It was rejected by several publishers before Collings accepted the manuscript; the published book then won the annual Carnegie Medal, annual Guardian Prize, and other book awards. The novel was adapted into an animated feature film in 1978, and later a television series which ran from 1999 to 2001. Later, a miniseries of the story was made and aired in the UK in 2018. It was also put on Netflix at the same time. Adams completed a sequel almost 25 years later, Tales from Watership Down (Random House, 1996; Hutchinson and Alfred A. Knopf imprints). It is a collection of 19 short stories about El-ahrairah and the rabbits of the Watership Down warren, with "Notes on Pronunciation" and "Lapine Glossary". The title refers to the rabbits' destination, Watership Down, a hill in the north of Hampshire, England, near the area where Adams grew up. The story began as tales that Richard Adams told his young daughters Juliet and Rosamond during long car journeys. As he explained in 2007, he "began telling the story of the rabbits ... improvised off the top of [his] head, as [they] were driving along." The daughters insisted he write it down—"they were very, very persistent". After some delay he began writing in the evenings and completed it 18 months later. The book is dedicated to the two girls. Adams's descriptions of wild rabbit behaviour were based on The Private Life of the Rabbit (1964), by British naturalist Ronald Lockley. The two later became friends, embarking on an Antarctic tour that became the subject of a co-authored book, Voyage Through the Antarctic (A. Lane, 1982). Watership Down was rejected seven times before it was accepted by Rex Collings. The one-man London publisher Collings wrote to an associate, "I've just taken on a novel about rabbits, one of them with extra-sensory perception. Do you think I'm mad?" The associate did call it "a mad risk," in her obituary of Collings, to accept "a book as bizarre by an unknown writer which had been turned down by the major London publishers; but," she continued, "it was also dazzlingly brave and intuitive." Collings had little capital and could not pay an advance but "he got a review copy onto every desk in London that mattered." Adams wrote that it was Collings who gave Watership Down its title. There was a second edition in 1973. Macmillan USA, then a media giant, published the first U.S. edition in 1974 and a Dutch edition was also published that year by Het Spectrum. According to WorldCat, participating libraries hold copies in 18 languages of translation. In the Sandleford warren,[a] Fiver, a young runt rabbit who is a seer, receives a frightening vision of his warren's imminent destruction. When he and his brother Hazel fail to convince their chief rabbit of the need to evacuate, they set out on their own, accompanied by nine other rabbits who choose to go with them. The first challenge in the small band's search for a new home comes immediately, as they are forced to elude the Owsla, the warren's military caste. Once out in the world, the travelling group of rabbits finds itself following the leadership of Hazel, who, until now, has been just another unimportant member of the warren. The group travels far and through dangerous territory. Bigwig and Silver, both former Owsla and the strongest rabbits among them, do well to keep the others protected, along with Hazel's keen observations and good judgment. They meet a rabbit named Cowslip, who invites them to join his warren. At first Hazel's group are relieved to finally be able to sleep and feed well – except for Fiver, who senses only death there. When Bigwig is nearly killed in a snare, the group realize that the new warren is managed by a farmer who protects and feeds the rabbits, but also harvests a number of them for their meat and skins. The residents of the new warren are simply using Hazel and the others to increase their own odds of survival. Fiver and the rest of the group work together to rescue Bigwig from the snare, then continue on their journey, taking with them a rabbit from Cowslip's warren called Strawberry, who asks to join them after his doe is killed in a snare. 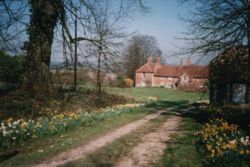 Fiver's visions have promised them a safe place in which to settle, and the group eventually finds Watership Down, which matches Fiver's description of the perfect home exactly. There they are soon reunited with Holly and Bluebell, who were with Bigwig in the Owsla. The two are nursing severe injuries which, they reveal, were inflicted as they escaped the violent human destruction of Sandleford and then later at Cowslip's warren. Holly also confesses that it was he who had tried to stop them leaving that first night, but Fiver's vision coming true has left him a changed rabbit and he is there to join them in whatever way they will have him. Although Watership Down is a peaceful habitat, Hazel realizes there are no does (female rabbits), making the future of the warren certain to end with the inevitable deaths of the rabbits present. 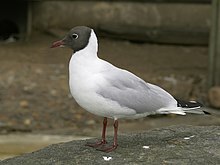 With the help of their useful new friend, a black-headed gull named Kehaar, they locate a nearby warren called Efrafa, which is overcrowded and has many does. Hazel sends a small embassy, led by Holly, to Efrafa to present their request for does. Meanwhile, Hazel and Pipkin, the smallest member of the group, scout the nearby Nuthanger Farm, where they find two pairs of hutch rabbits. Despite their uncertainty about living wild, the hutch rabbits are willing to come to Watership. Hazel leads a raid on the farm the next day, during which he rescues both does but only one of the bucks. When the emissary returns soon after, Hazel and his rabbits learn that Efrafa is a police state led by the despotic General Woundwort. Holly and the other rabbits dispatched there have managed to return with little more than their lives intact. However, Holly's group has managed to identify an Efrafan doe named Hyzenthlay who wishes to leave the warren and can recruit other does to join in the escape. Hazel and Bigwig devise a plan to rescue Hyzenthlay's group and bring them to Watership Down, after which the Efrafan escapees start their new life of freedom. Shortly thereafter, however, the Owsla of Efrafa, led by Woundwort himself, arrives to attack the newly formed warren at Watership Down. Through Bigwig's bravery and loyalty, and Hazel's ingenuity, the Watership Down rabbits seal the fate of the Efrafan general by unleashing the Nuthanger Farm watchdog. As the Efrafans flee in terror, Woundwort, despite being greatly wounded in his battle with Bigwig, refuses to back down and leaps at the dog. His body is never found, and at least one of his former followers continues to believe in his survival. Hazel is nearly killed by a cat, but he is saved by the farm girl Lucy, the owner of the escaped hutch rabbits. The story's epilogue tells the reader of how Hazel, dozing in his burrow one "chilly, blustery morning in March" some years later, is visited by El-ahrairah, the spiritual overseer of all rabbits, and hero of many rabbit stories. El-ahrairah invites Hazel to join his own Owsla, reassuring him of his warren's success and its future. Leaving his friends and no-longer-needed body behind, Hazel departs Watership Down with the spirit guide. Hazel: The protagonist, Fiver's older brother; he leads the rabbits from Sandleford and eventually becomes the Chief Rabbit. Though Hazel is not particularly large or powerful, he is loyal, brave and a quick thinker. He sees the good in each individual, and what they bring to the table; in so doing, he makes sure that no one gets left behind, thus earning the respect and loyalty of his warren. He often relies on Fiver's advice, and trusts in his brother's instincts immensely. Fiver: A runt rabbit whose name literally means "Little Thousand" (rabbits have a single word, "hrair", for all numbers greater than four; Fiver's name in Lapine, Hrairoo, indicates that he is the smallest of a litter of five or more rabbits) and Hazel's younger brother. As a seer, he has visions and strong instincts. Fiver is one of the most intelligent rabbits in the group. He is quiet and intuitive, and though he does not directly act as a leader, the others listen to and follow his advice. Vilthuril becomes his mate. Bigwig: An ex-Owsla officer, and the largest and bravest rabbit of the group. His name in Lapine is Thlayli, which literally means "Fur-head" and refers to the shock of fur on the back of his head. Though he is powerful and fierce, he is also shown to be cunning in his own way when he devises a plan to defeat the larger and stronger General Woundwort. His final battle with Woundwort leaves him severely wounded, but he survives and becomes the leader of Hazel's Owsla. Blackberry: A clever buck rabbit with black-tipped ears. He is often capable of understanding concepts that the other rabbits find incomprehensible. He realises, for instance, that wood floats, and the rabbits use this tactic twice to travel on water. He also works out how to dismantle the snare that almost kills Bigwig, saving him. He is one of Hazel's most trusted advisors, given the task to plan a way to rescue does from Efrafa. Holly: Former captain of the Sandleford Warren Owsla, escapes with Bluebell when his warren is destroyed by men. He is near death when he finds the warren at Watership Down, but is nursed back to health and becomes one of Hazel's most trusted companions. Bluebell: Buck rabbit who escapes with Holly during the destruction of Sandleford and tells jokes to cope and help Holly recover from the mental strain of seeing the Sandleford warren destroyed. He will often jokingly speak in rhyme. Strawberry: Buck from Cowslip's warren who leaves with the Watership Down rabbits after his doe is killed by a snare. Strawberry is strong and sleek but not as hardy as the other rabbits given his warren upbringing but learns quickly and gets along well with the group. It is for this reason that he is selected to represent the rabbits on an expedition to Efrafa. Haystack: One of the hutch rabbits who escapes in order to live with the wild rabbits. Buckthorn: A strong buck who was expected to be part of the Sandleford Owsla once he reached maturity. Hawkbit: Described in the book as a "rather stupid rabbit" but is accepted by Hazel regardless. Dandelion: A buck rabbit notable for his storytelling ability and speed. He is instrumental in luring the Nuthanger Farm dog into the Efrafans during the siege of Watership Down. Silver: A strong buck rabbit, given his name for his silver-grey fur, he fights alongside Bigwig and helps defend the rabbits during their journey. He is teased for his silver fur at the Sandleford warren which is one of the reasons he was more willing to leave. Pipkin: A small and timid buck rabbit, who looks to Hazel for guidance and protection. Hazel encourages him, and Pipkin grows loyal to Hazel. He proves to be a constant comforter, particularly for Holly after the destruction of Sandleford warren. His name is Hlao in Lapine. Hyzenthlay: A doe who lives in Efrafa and assists Bigwig in arranging for the liberation of its inhabitants. General Woundwort, who suspects her of fomenting dissension, orders his guards to keep a close eye on her. She escapes Efrafa with Bigwig and becomes Hazel's mate. Like Fiver, she has visions. Her name means literally "shine-dew-fur", or "fur shining like dew". Vilthuril: A doe who lives in Efrafa. Similar to Fiver and Hyzenthlay, it is understood that she has visions and is a seer. She escapes Efrafa with Bigwig, Hyzenthlay and the other does. She becomes Fiver's mate and is said to be the only one to understand him as well as Hazel. Blackavar: A rabbit with dark fur who tries to escape from Efrafa but is apprehended, mutilated, and put on display to discourage further escape attempts. When he is liberated by Bigwig, he quickly proves himself an expert tracker and ranger, and also shows himself to be an effective fighter when the Efrafan rabbits attack the warren. Kehaar: A black-headed gull who is forced, by an injured wing, to take refuge on Watership Down, and befriends the rabbits when they help him. He is characterized by his frequent impatience, guttural accent and unusual phrasing. After discovering the Efrafa warren and helping the rabbits, he rejoins his colony, but promises to visit. According to Adams, Kehaar was based on a fighter from the Norwegian Resistance in World War II. General Woundwort: The main antagonist, a fearless, cunning and brutally efficient rabbit who was orphaned at a young age, Woundwort founded the Efrafa warren and is its tyrannical chief. Though larger and stronger than Bigwig, he lacks mercy and kindness. He even leads an attack to destroy the Watership warren as an act of revenge against Bigwig stealing does from Efrafa, which is narrowly defeated by Hazel's ingenuity and Bigwig's bravery. After his apparent death fighting the Nuthanger farm dog, he lives on in rabbit legend as a bogeyman. Captain Campion: Woundwort's most trusted subordinate, Campion is a loyal, brave and clever officer. After Woundwort disappears, he becomes the Chief Rabbit of Efrafa and reforms it, making peace with the Watership rabbits. Vervain: The head of the Council police in Efrafa, said to be one of the most hated rabbits in the warren. When Woundwort's forces storm the Honeycomb, he is ordered by Woundwort to kill Fiver, but Fiver's supernatural calmness and prophesising of his (Vervain's) death terrify him into fleeing, and he is never seen again. Frith: A god-figure who created the world and promised that rabbits would always be allowed to thrive. In Lapine, his name literally means "the sun". El-ahrairah: A rabbit trickster folk hero, who is the protagonist of nearly all of the rabbits' stories. He represents what every rabbit wants to be; smart, devious, tricky, and devoted to the well-being of his warren. In Lapine, his name is a contraction of the phrase Elil-hrair-rah, which means "prince with a thousand enemies". His stories of cleverness (and excessive hubris) are similar to Br'er Rabbit and Anansi. His name is pronounced with the same cadence as the phrase "Never say die", thus, "El-a-hrai-rah". Prince Rainbow: A god-figure who serves as a foil to El-ahrairah. He attempts to rein in El-ahrairah several times, but is always outsmarted by the rabbit. Rabscuttle: Another mythical folk hero, Rabscuttle is El-ahrairah's second in command and the Owsla leader. He participates in many of the El-ahrairah's capers. He is considered to be almost as clever as his chief. Black Rabbit of Inlé: A sombre phantom servant of the god Frith who appears in rabbit folklore as a kind of analogue to the grim reaper, and similarly ensures all rabbits die at their predestined time. "Inlé" is the Lapine term for the moon or darkness. "Lapine" is a fictional language created by author Richard Adams for the novel, where it is spoken by the rabbit characters. The language was again used in Adams' 1996 sequel, Tales from Watership Down, and has appeared in both the film and television adaptations. The language fragments in the books consist of a few dozen distinct words, used mainly for the naming of rabbits, their mythological characters, and objects in their world. The name "Lapine" comes from the French word for rabbit. Watership Down has been described as an allegory, with the labours of Hazel, Fiver, Bigwig, and Silver "mirror[ing] the timeless struggles between tyranny and freedom, reason and blind emotion, and the individual and the corporate state." Adams draws on classical heroic and quest themes from Homer and Virgil, creating a story with epic motifs. Themes can also be deduced from the quotations with which Adams headed each chapter, which come from a wide variety of sources including Classical literature, 19th century poetry, popular songs and Shakespeare. The book explores the themes of exile, survival, heroism, leadership, political responsibility, and the "making of a hero and a community". Joan Bridgman's analysis of Adams's works in The Contemporary Review identifies the community and hero motifs: "[T]he hero's journey into a realm of terrors to bring back some boon to save himself and his people" is a powerful element in Adams's tale. This theme derives from the author's exposure to the works of mythologist Joseph Campbell, especially his study of comparative mythology, The Hero with a Thousand Faces (1949), and in particular, Campbell's "monomyth" theory, also based on Carl Jung's view of the unconscious mind, that "all the stories in the world are really one story." The concept of the hero has invited comparisons between Watership Down's characters and those in Homer's Odyssey and Virgil's Aeneid. Hazel's courage, Bigwig's strength, Blackberry's ingenuity and craftiness, and Dandelion's and Bluebell's poetry and storytelling all have parallels in the epic poem Odyssey. Kenneth Kitchell declared, "Hazel stands in the tradition of Odysseus, Aeneas, and others". Tolkien scholar John Rateliff calls Adams's novel an Aeneid "what-if" book: what if the seer Cassandra (Fiver) had been believed and she and a company had fled Troy (Sandleford Warren) before its destruction? What if Hazel and his companions, like Odysseus, encounter a seductive home at Cowslip's Warren (Land of the Lotus Eaters)? Rateliff goes on to compare the rabbits' battle with Woundwort's Efrafans to Aeneas's fight with Turnus's Latins. "By basing his story on one of the most popular books of the Middle Ages and Renaissance, Adams taps into a very old myth: the flight from disaster, the heroic refugee in search of a new home, a story that was already over a thousand years old when Virgil told it in 19 BC." It has been suggested that Watership Down contains symbolism of several religions, or that the stories of El-ahrairah were meant to mimic some elements of real-world religion. When asked in a 2007 BBC Radio interview about the religious symbolism in the novel, Adams stated that the story was "nothing like that at all." Adams said that the rabbits in Watership Down did not worship; however, "they believed passionately in El-ahrairah". Adams explained that he meant the book to be "only a made-up story... in no sense an allegory or parable or any kind of political myth. I simply wrote down a story I told to my little girls". Instead, he explained, the "let-in" religious stories of El-ahrairah were meant more as legendary tales, similar to a rabbit Robin Hood, and that these stories were interspersed throughout the book as humorous interjections to the often "grim" tales of the "real story". The Economist heralded the book's publication, saying "If there is no place for Watership Down in children’s bookshops, then children’s literature is dead." Peter Prescott, senior book reviewer at Newsweek, gave the novel a glowing review: "Adams handles his suspenseful narrative more dextrously than most authors who claim to write adventure novels, but his true achievement lies in the consistent, comprehensible and altogether enchanting civilisation that he has created." Kathleen J. Rothen and Beverly Langston identified the work as one that "subtly speaks to a child", with "engaging characters and fast-paced action [that] make it readable." This echoed Nicholas Tucker's praise for the story's suspense in the New Statesman: "Adams ... has bravely and successfully resurrected the big picaresque adventure story, with moments of such tension that the helplessly involved reader finds himself checking whether things are going to work out all right on the next page before daring to finish the preceding one." D. Keith Mano, a science fiction writer and conservative social commentator writing in the National Review, declared that the novel was "pleasant enough, but it has about the same intellectual firepower as Dumbo." He pilloried it further: "Watership Down is an adventure story, no more than that: rather a swashbuckling crude one to boot. There are virtuous rabbits and bad rabbits: if that’s allegory, Bonanza is an allegory." John Rowe Townsend notes that the book quickly achieved such a high popularity despite the fact that it "came out at a high price and in an unattractive jacket from a publisher who had hardly been heard of." Fred Inglis, in his book The Promise of Happiness: Value and meaning in children's fiction, praises the author’s use of prose to express the strangeness of ordinary human inventions from the rabbits' perspective. Watership Down's universal motifs of liberation and self-determination have been identified with by readers from a diversity of backgrounds; the author Rachel Kadish, reflecting on her own superimposition of the founding of Israel onto Watership Down, has remarked "Turns out plenty of other people have seen their histories in that book...some people see it as an allegory for struggles against the Cold War, fascism, extremism...a protest against materialism, against the corporate state. Watership Down can be Ireland after the famine, Rwanda after the massacres." Kadish has praised both the fantasy genre and Watership Down for its "motifs [that] hit home in every culture...all passersby are welcome to bring their own subplots and plug into the archetype." Adams won the 1972 Carnegie Medal from the Library Association, recognising the year's best children's book by a British subject. He also won the annual Guardian Children's Fiction Prize, a similar award that authors may not win twice. [b] In 1977 California schoolchildren selected it for the inaugural California Young Reader Medal in the Young Adult category, which annually honours one book from the last four years. In The Big Read, a 2003 survey of the British public, it was voted the forty-second greatest book of all time. The 1993 Puffin Modern Classics edition of the novel contains an afterword by Nicholas Tucker, who wrote that stories such as Watership Down "now fit rather uneasily into the modern world of consideration of both sexes". He contrasted Hazel's sensitivity to Fiver with the "far more mechanical" attitude of the bucks towards the does portrayed as "little more than passive baby-factories". In the New York Times Book Review essay "Male Chauvinist Rabbits", Selma G. Lanes observed that the does are only "instruments of reproduction" to prevent the achievement of reaching Watership Down from "becoming a hollow victory". Lanes argued that this view of female rabbits came from Adams rather than his source text, Ronald Lockley's The Private Life of the Rabbit in which the rabbit world is matriarchal, and new warrens are initiated by dissatisfied young females. In similar vein, literary critic Jane Resh Thomas stated that Watership Down "draws upon ... an anti-feminist social tradition which, removed from the usual human context and imposed upon rabbits, is eerie in its clarity". Thomas also called it a "splendid story" in which "anti-feminist bias ... damages the novel in only a minor way". Adams' 1996 sequel, Tales from Watership Down includes stories where the female rabbits play a more prominent role in the Watership Down warren. It has been suggested that this might have been an attempt to modernise the story, to make it more in tune with the political sensibilities of the 1990s when it was published. In 1978 Martin Rosen wrote and directed an animated film adaptation of Watership Down. The voice cast included John Hurt, Richard Briers, Harry Andrews, Simon Cadell, Nigel Hawthorne, and Roy Kinnear. The film featured the song "Bright Eyes", sung by Art Garfunkel. Released as a single, the song became a UK number one hit, despite Richard Adams "hat[ing]" it. Although the essentials of the plot remained relatively unchanged, the film omitted several side plots. Though the Watership Down warren eventually grew to seventeen rabbits, with the additions of Strawberry, Holly, Bluebell, and three hutch rabbits liberated from the farm, the movie only includes a band of eight. Rosen's adaptation was praised for "cutting through Adams' book ... to get to the beating heart". The film has also seen some positive critical attention. In 1979 the film received a nomination for the Hugo Award for Best Dramatic Presentation. Additionally, British television station Channel 4's 2006 documentary 100 Greatest Cartoons named it the 86th greatest cartoon of all time. From 1999 to 2001, the book was also adapted as an animated television series, broadcast on CITV in the UK and on YTV in Canada. It was produced by Martin Rosen and starred several well-known British actors, including Stephen Fry, Rik Mayall, Dawn French, John Hurt, and Richard Briers, running for a total of 39 episodes over three seasons. Although the story was broadly based on that of the novel and most characters and events retained, some of the story lines and characters (especially in later episodes) were entirely new. In 2003, the second season was nominated for a Gemini Award for Best Original Music Score for a Dramatic Series. In July 2014, it was announced that the BBC would be airing a new animated series based on the book and in April 2016 that the series would be a co-production between the BBC and Netflix, consisting of four one-hour episodes, with a budget of £20 million. The four episode miniseries premiered on the BBC and Netflix on 23 December 2018, with the voices of James McAvoy as Hazel, John Boyega as Bigwig, and Ben Kingsley as General Woundwort. It received generally positive reviews, with praise for the performances of its voice cast, but receiving criticism for its tone and the quality of the computer animation. In 2006, Watership Down was again adapted for the stage, this time by Rona Munro. It ran at the Lyric Hammersmith in London. Directed by Melly Still, the cast included Matthew Burgess, Joseph Traynor, and Richard Simons. The tone of the production was inspired by the tension of war: in an interview with The Guardian, Still commented, "The closest humans come to feeling like rabbits is under war conditions ... We've tried to capture that anxiety." A reviewer at The Times called the play "an exciting, often brutal tale of survival" and said that "even when it’s a muddle, it’s a glorious one." In 2011, Watership Down was adapted for the Lifeline Theatre in Chicago by John Hildreth. This production was directed by Katie McLean Hainsworth and the cast included Scott T. Barsotti, Chris Daley, Paul S. Holmquist, and Mandy Walsh. Watership Down inspired the creation of Bunnies & Burrows, a role-playing game in which the main characters are talking rabbits, published in 1976 by Fantasy Games Unlimited. It introduced several innovations to role-playing game design, being the first game to allow players to have non-humanoid roles, as well as the first with detailed martial arts and skill systems. Fantasy Games Unlimited published a second edition of the game in 1982, and the game was modified and republished by Steve Jackson Games as an official GURPS supplement in 1992. In 2002, a two-part, two-hour dramatization of Watership Down by Neville Teller was broadcast by BBC Radio 4. In November 2016, a new two-part two-hour dramatization, written by Brian Sibley, was broadcast on BBC Radio 4. In the 1970s, the book was released by Argo Records read by Roy Dotrice, with musical background—music by George Butterworth performed by Academy of St Martin in the Fields under the direction of Neville Marriner. In 1984, Watership Down was adapted into a four-cassette audiobook by John Maher in association with the Australian Broadcasting Company's Renaissance Players. Produced by John Hannaford and narrated by Kerry Francis, the audiobook was distributed by The Mind's Eye. In 1990, a 16-hour, 11-cassette recording read by John MacDonald was published by Books on Tape, Inc. of Santa Ana, CA. Andrew Sachs recorded a five and a half hour abridged version of the story for Puffin Audiobooks. In 2010, Audible.com released an unabridged digital download of the book, narrated by the multiple award–winning Ralph Cosham. In the American TV show Robot Chicken, a parody of the book is done with the Fraggles, the main characters of the show Fraggle Rock, in place of the rabbits. The November 1974 issue of National Lampoon magazine, released shortly after the resignation and pardon of President Richard Nixon, featured a satirical parody of the novel entitled "Watergate Down", in which rabbits are replaced by rats, described as animals with "the morals of a Democrat and the ethics of a Republican." ^ The map in front of book indicates that the story begins in the real-life Wash Common, just beyond the western tip of the park and parish of Sandleford, on the Berkshire-Hampshire border. ^ Six books have won both awards in 45 years through 2011; alternatively, six authors have won the Carnegie Medal in Literature for their Guardian Prize-winning books. Professional librarians confer the Carnegie and select the winner from all British children's books. The Guardian newspaper's prize winner is selected by British children's writers, "peers" of the author who has not yet won it, for one children's (age 7+) or young-adult fiction book. Details regarding author and publisher nationality have varied. ^ "Watership Down" (library catalog record for a copy of the first edition). WorldCat. Retrieved 26 July 2012. ^ "Watership Down (by) Richard Adams". Library of Congress Catalog Record. Retrieved 31 July 2012. 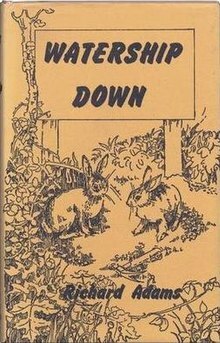 ^ a b "Watership Down (by) Richardo Adams" (first U.S. edition). LCC record. Retrieved 31 July 2012. ^ Richard Adams: Forever animated by the life of animals. The Independent (online). Retrieved 23 December 2012. ^ a b Rateliff, John D. "Classics of Fantasy". Wizards of the Coast, Inc. Archived from the original on 28 December 2008. Retrieved 21 March 2008. ^ a b BBC Berkshire (16 March 2007). "Interview: Richard Adams". BBC. Retrieved 15 March 2008. ^ Tales from Watership Down (first edition) publication contents at the Internet Speculative Fiction Database. Retrieved 8 September 2012. ^ Sally Eckhoff (26 November 1996). "Tales from Watership Down". Salon.com. Archived from the original on 7 December 2007. Retrieved 15 March 2008. ^ a b c Swaim, Don (10 April 1985). "Audio Interview with Richard Adams". Book Beat. CBS Radio Stations News Service. Archived from the original (audio) on 18 February 2008. Retrieved 21 March 2008. ^ Richard Adams (1972). Watership Down. United Kingdom: Rex Collings. ^ a b "Ronald Lockley: Find More Like This". The Economist. 355 (8168): 84. 29 April 2000. In 1964 he had published The Private Life of the Rabbit. This study of the habits of the wild rabbit gathered by Mr Lockley persuaded Richard Adams to write Watership Down, a kind of Disney story for adults, which became an immediate bestseller. ^ Douglas Martin (4 April 2000). "Ronald Lockley, of Rabbit Fame, Dies at 96". The New York Times. Retrieved 26 April 2008. In his acknowledgments, Mr. Adams credited Mr. Lockley's book for his own description of bunny behavior in his tale of wandering rabbits. ^ Quigly, Isabel (8 June 1996). "Obituary: Rex Collings". The Independent. Retrieved 26 July 2012. ^ a b Adams, Richard. "Introduction." Watership Down, Scribner U.S. edition, 2005. ISBN 0-7432-7770-8. ^ Watership Down title listing at the Internet Speculative Fiction Database. Retrieved 31 July 2012. ^ "Formats and editions of Watership Down". WorldCat. Retrieved 31 July 2012. ^ Adams, Richard (2005). Watership Down (1st Scribner trade paperback ed.). New York: Scribner. p. 5. ISBN 0-7432-7770-8. There were probably more than five rabbits in the litter when Fiver was born, but his name, Hrairoo, means "Little Thousand"--i.e., the little one of a lot or, as they say of pigs, the "runt." ^ a b "Masterplots II: Juvenile and Young Adult Fiction Series (Watership Downs)". Salem Press, Inc. 1991. ^ a b Bridgman, Joan (August 2000). "Richard Adams at Eighty". The Contemporary Review. The Contemporary Review Company Limited. 277.1615: 108. ISSN 0010-7565 – via The Free Library. ^ a b Prescott, Peter S. (18 March 1974). "Rabbit, Read". Newsweek: 114. ^ a b Rothen, Kathleen J.; Beverly Langston (March 1987). "Hazel, Fiver, Odysseus, and You: An Odyssey into Critical Thinking". The English Journal. National Council of Teachers of English. 76 (3): 56–59. ISSN 1544-6166. ^ Kitchell, Jr., Kenneth F. (Fall 1986). "The Shrinking of the Epic Hero: From Homer to Richard Adams's Watership Down". Classical and Modern Literature: A Quarterly. 7 (1): 13–30. ISSN 0197-2227. ^ Adams, Richard (2005). Watership Down. New York, NY: Scribner. pp. xvi. ISBN 978-0-7432-7770-9. ^ "Interview: Richard Adams". BBC Berkshire Website. 16 March 2007. Retrieved 22 February 2009. ^ "Pick of the Warren". The Economist: 47. 23 December 1972. ^ Tucker, Nicholas (22 December 1972). "Animal Epic". New Statesman: 950. ^ Mano, D. Keith (26 April 1974). "Banal Bunnies". National Review: 406. ^ Inglis, Fred (1981). The Promise of Happiness: Value and meaning in children's fiction. Cambridge University Press. pp. 204–205. ISBN 0-521-23142-6. ^ Rachel Kadish (September – October 2011). "Whose Parable Is It Anyway?". Moment Magazine. Archived from the original on 4 October 2011. Retrieved 3 October 2011. ^ Carnegie Winner 1972 Archived 29 January 2013 at the Wayback Machine. Living Archive: Celebrating the Carnegie and Greenaway Winners. CILIP. Retrieved 27 February 2018. ^ "British Children's Literature Awards: Guardian Children's Prize for Fiction" (PDF). Burnaby Public Library. 2007. Archived from the original (PDF) on 28 November 2007. Retrieved 28 March 2008. ^ "Guardian children's fiction prize relaunched: Entry details and list of past winners". theguardian 12 March 2001. Retrieved 31 July 2012. ^ "Winners". California Young Reader Medal. Archived from the original on 27 May 2011. Retrieved 8 May 2011. ^ "The Big Read: Top 100 Books". BBC. April 2003. Retrieved 28 March 2008. ^ Tucker, Nicholas (1993). "Afterword". In Richard Adams, Watership Down. London: Puffin Modern Classics. ISBN 978-0-14-036453-8. In later printings of the same edition, however, this part of the afterword is excised. ^ Lanes, Selma G. "Male Chauvinist Rabbits". The New York Times. Retrieved 10 July 2016. ^ Resh Thomas, Jane (4 August 1974). "Old Worlds and New: Anti-Feminism in Watership Down". The Horn Book. L (4): 405–08. ^ J. D. Biersdorfer (1 December 1996). "Books in Brief: Fiction". The New York Times. ^ Collings, Stephen (2003–2008). "Watership Down (1978)". BFI Screenonline. Retrieved 28 March 2008. ^ "I HATE "Bright Eyes"!". lettersofnote.com. Retrieved 14 January 2019. ^ Phil Villarreal (15 July 2005). "Phil Villarreal's Review: Watership Down". Arizona Daily Star. Archived from the original on 27 December 2008. Retrieved 11 May 2008. ^ "1979 Hugo Awards". World Science Fiction Society. Retrieved 11 May 2008. ^ "100 Greatest Cartoons". Channel 4. 27 February 2005. Retrieved 11 May 2008. ^ "Canada's Awards Database". Academy of Canadian Cinema and Television. 2003. Retrieved 26 April 2008. ^ "Watership Down to be adapted on TV". 10 July 2014. ^ Alex Ritman (27 April 2016). "Netflix Bags Global Rights for 'Watership Down' Adaptation With John Boyega, James McAvoy, Nicholas Hoult". Hollywood Reporter. Retrieved 28 April 2016. ^ John Plunkett (27 April 2016). "Netflix Bags Global Rights for 'Watership Down' Adaptation With John Boyega, James McAvoy, Nicholas Hoult". The Guardian. Retrieved 28 April 2016. ^ "Watership Down revival slammed as "tame" and "confusing" by critics – but the all-star voice cast gets glowing reviews". Radio Times. Retrieved 26 December 2018. ^ Prudom, Laura. "WATERSHIP DOWN REVIEW". IGN. Retrieved 26 December 2018. ^ "Watership Down (2018)". Metacritic. Retrieved 25 December 2018. ^ Gardner, Lyn (22 November 2006). "Down the rabbit hole". The Guardian. London. Retrieved 21 March 2008. The closest humans come to feeling like rabbits is under war conditions. Imagine what it would be like if every time we stepped out on the street, we know we could be picked off by a sniper. We've tried to capture that anxiety in the way the rabbits speak—lots of short, jerky sentences. ^ Sam Marlowe (29 November 2006). "Watership Down". The Times. London. Retrieved 21 March 2008. ^ "Lifeline Theatre :: Watership Down: Cast & Crew". www.lifelinetheatre.com. Retrieved 26 May 2017. ^ "nevilleteller.co.uk". www.nevilleteller.co.uk. Retrieved 17 February 2017. ^ "Richard Adams - Watership Down - BBC Radio 4 Extra". BBC. Retrieved 17 February 2017. ^ Adams, Richard (1 January 1976). Watership Down: Read by Roy Dotrice. Talking Book. ASIN B01IW6MGAU. ^ "George Butterworth - Scenes From Watership Down". Discogs. Retrieved 17 February 2017. ^ Watership Down. The Mind's Eye. 1984. ISBN 0-88142-559-1. ^ Adams, Richard (1990). Watership Down. Newport Beach, Calif. : Books on Tape. ISBN 9780736617000. OCLC 21266537 – via http://www.worldcat.org/. ^ Adams, Richard (27 November 1997). "Watership Down read by Andrew Sachs". www.bookdepository.com. Penguin Books Ltd. ISBN 9780140866926. Retrieved 17 February 2017. ^ Adams, Richard (21 May 2010). Watership Down, narrated by Ralph Cosham. Blackstone Audio, Inc. ASIN B003NGXOSI. ^ "Season 3, Episode 18 Monstourage". TV Guide. Retrieved 14 October 2017. Christian Høgsbjerg (February 2017). "A vivid warning about dangers to the planet posed by capitalism". Socialist Review (421). An examination of Watership Down using tools provided by Marx, Engels and Gramsci.